Last year when the BP spill first started, I had this idea that people who couldn’t go to the Gulf themselves would be willing to support others who were willing to go and witness the disaster unfold, and help the situation in some way. That idea proved to be valid beyond my wildest dreams. The support from all over the globe has touched my heart in ways I could never have expected when I first hopped in the car last Summer to visit the coast and share stories with my friends and family. We have raised over $10,000 in individual contributions in just one month during our Phase 1 IndieGoGo fundraiser, and more is on the way through a series of private fundraisers and personal donations. It is so great to be a part of such an amazing and important project. I give this contribution out of love for Brandon, and to help him help make a difference. This is so important to raise awareness and educate others about the environment and the world that we live in. It’s crucial for our future. Please, please, please donate too. although I’m not able to contribute more when I can I will because I believe in this. For Devon Haas, the most inspirational young person I have ever seen. Living on the coast, we saw this disaster first hand. It’s amazing to have children so interested in making a difference. I am honored to help out with a donation. I believe if we were all educated as to what else we could do in lieu of oil/petroleum products and be opened up to great leaders who are pioneering the way, more of us would follow and step up to new innovative ways. 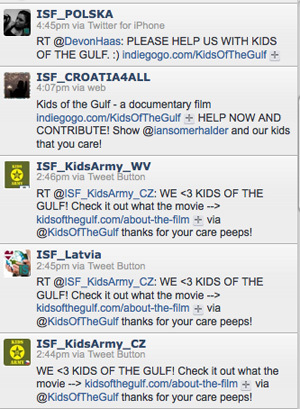 @Brandon101 @KidsOfTheGulf Congrats on raising more than $10k thru crowd funding! Shows there is a lot of support for the project! Comments like the ones above are the reason this work continues to inspire me. I’ve been blown away by the tireless support on Twitter from kids from 48 countries around the world that see this project as more than a film – they see a movement. Kids have saved up their allowance money for weeks at a time to donate to this initiative, and one family outside Clearwater, Florida is even organizing a pep rally at their local high school to raise money. We have a long way to go to meet our production budgets, but we are off to a great start, and the 166 people who stepped up and contributed have proven beyond doubt that there is strong, global support for this story. We begin filming in less than a week, and we continue to seek additional funding and sponsorships where appropriate. If you would like to learn more or if you have ideas for fundraising or sponsorships, please leave a comment or shoot me a note and let’s discuss how we can work together. I’m eternally grateful for the support we have received thus far and for the incredible energy that these kids have brought to my life. I’m humbled by the faith that has been placed in my hands and will do my absolute best to honor the kids who are saving up and speaking out, and especially those along the Gulf who have suffered so much in this tragedy. What does this story mean to you? Are you inspired to take action or get involved?